Quaker is a huge, red, male, greyhound that raced at 94lbs. He raced at the Caliente track in Mexico then moved to Derby Lane in Florida and raced most of his 142 races there. He was pretty good and eventually got up to the top A level. In his last race on Feb 4th he broke a bone in his leg. 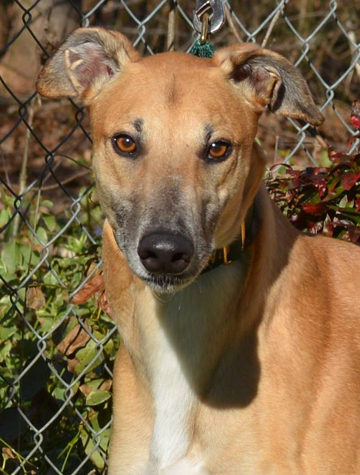 He had surgery in Florida and was sent to Pro Greyhound in NC, a greyhound rehab center. He is expected to make a full recovery. We will place him as soon as he is released by the vets for adoption. That usually takes 8 to 12 weeks. Quaker is a very friendly guy with a sweet calm personality. Very loving. His sire is the famous Flying Hydrogen and his dam is Bella Folklore. More as we get to know him. Quaker lived a very happy life with his new family at the beach until he earned his wings on 8/24/18 due to bone cancer- osteosarcoma.